The new SPOT 5 satellite is designed to ensure SPOT data users continuity of service, enhanced image quality and improved services. The two new HRG instruments, derived from the HRVIR instruments on SPOT 4, offer higher resolution: 2.5 metres to 5 metres in panchromatic mode and 10 metres in multispectral mode. Imagery at a resolution of 2.5 metres is generated using a new sampling concept dubbed "Supermode". SPOT 5 features a new HRS imaging instrument operating in panchromatic mode. 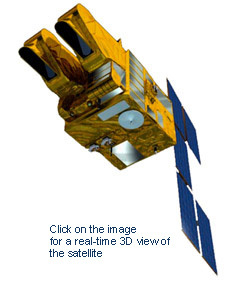 HRS points forward and aft of the satellite, giving it the ability to acquire stereopair images almost simultaneously to map relief. SPOT 5 is also carrying the recurrent VEGETATION 2 instrument and the DORIS instrument. The SPOT 5 bus is also derived from SPOT 4. A new star tracker will improve image location accuracy from 350 metres on previous satellites to just 50 metres.